In 2014 Shenzhen was ranked as the most crowded city in China and there are now more than 15 million people living here across seven districts. Somewhat surprisingly the transportation systems manage to cope well with the growing population as the government continues to expand the travel networks across the city. With a little patience and a little knowledge you can expect to move fairly effortlessly from one destination to another. P.s. If you need an hotel in Shenzhen, here you find our recommendations. 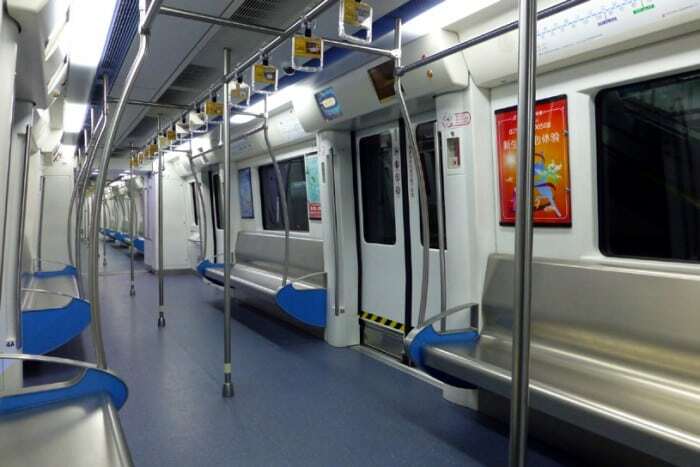 The Shenzhen Metro is probably one of the most convenient and easy to understand methods of travel. Fast and efficient subway trains run every 3 to 5 minutes and currently five lines can transfer you to most popular destinations in the city. The subway and trains offer a very high standard of clean, safe and easy travel and stations are announced in both Mandarin and English. Metro tickets are priced according to the distance traveled, and fares vary from 2 Yuan to 11 Yuan. Children under six get to travel free if accompanied by an adult. You can pay by cash or travel card and ticket machines offer both English and Chinese instructions. Simply touch the station name to calculate the fare. After payment a green token is dispensed, which must be scanned as you enter and deposited when you exit a station. Don’t lose your token, you will be charged a penalty fee if it is lost! All luggage and handbags have to pass through an X-Ray scanner as you enter the subway, but strangely in my experience, shopping bags are always waved through unchecked! If you are spending any length of time in Shenzhen then I would definitely recommend investing in a travel card, known locally as a “Shenzhen Tong”. This card can be used on both the metro and on the extensive bus system, and you will enjoy a small additional discount. To buy a Tong Card, go to one of the manned booths in the metro stations and give them 100 Yuan. They will keep 50 Yuan as a returnable deposit, and put 50 Yuan credit on the card. Each time you use the card on the metro or bus system you can see how much credit you have remaining, ensuring that you top up before running out! All stations have public toilets, telephones and cell phone service is available throughout the network if you subscribe to China Mobile, China Telecom or China Unicom. A word of warning though – please “Be Careful of Pinching” when traveling on the metro! No, it’s not a sign about theft, it’s a sign on all the train doors – be careful not to get caught in the doors! “Chinglish” at it’s best! The Shenzhen Metro Company has a good website in English with a journey planner and a full set of maps. With almost 500 bus lines and around 10,000 buses, Shenzhen has an excellent city bus system. There are three main bus companies and buses on main transport routes are plentiful. I can often choose between 3 and 5 buses every morning, all of which will arrive at my stop at the same time. My 30 minute journey to work costs me 2 Yuan, or only 1.6 Yuan if I scan my travel card. Ordinary B line buses charge from 1 Yuan, but on a hot day I always opt for the slightly more expensive M or K buses that have air-conditioning and fewer stops. Expect to pay a little more for longer distances where stage payments will necessitate that you know your bus stop in Chinese. I like to use the buses above all because the driver uses his initiative. If there is no-one at the stop or another bus with the same number is already there he will bypass the stop altogether. Bus stops are known as “bus stations” in China and whilst the network is extensive, it is a little more difficult to work out the routes than on the metro. Stops are announced in English and all bus stations show the English name. However, timetables are shown only in Chinese, so our system involved walking the route and photographing all the stops along the way to see which bus numbers stop at which bus station. Some parts of the city can get extremely congested during rush hours and the buses can get full at these times. So visitors should take this into account when planning their schedule. I’ve also discovered that Chinese bus passengers have a tendency not to move aside to allow travelers off of the bus. Until I realized that it wasn’t considered rude to push your way through to the exit door I often missed my stop as I remained sandwiched between commuters in the middle of the bus! A final word on bus vocabulary – remember, a bus stop in China is called a bus station. A bus station in China is called a bus terminal! The official taxi system in Shenzhen is well regulated and rarely will you experience problems or long “out of the way” journeys to elicit a higher fee. The cars are easily spotted – they are all a dull shade of red and silver. The meter starts at 10 Yuan for the first 2 km and then rises thereafter. I have traveled fairly long distances of over half an hour and haven’t yet run up a bill of over 50 Yuan. Do make sure that the meter is running when you get in the car and check the license is on display – it should be prominently positioned on the right hand side of the dashboard. Don’t be afraid to move on to the next driver if you feel at all uncomfortable. Fuel surcharges seem to vary but they are currently set at 3 Yuan per trip. Drivers don’t generally speak English, so make sure you have your destination written in Chinese or have a Chinese friend available at the end of your phone to explain where you want to go. Receipts can be requested easily with a little sign language and tipping is not expected at all. I do however, usually round up to the closest Yuan when making payment. China is currently home to the top three largest electric taxi fleets in the world. One of these is in Shenzhen, where there is a fleet of around 800 electric taxis. They are blue and white, and so easily distinguished from the normal red taxis. There is no fuel surcharge applied to the fare for these cars. The unofficial taxi system is another story altogether. Even local Chinese have to haggle endlessly before embarking on their journey to get a reasonable fare. My advice would be to always avoid these unlicensed taxis – they are especially noticeable at border crossings trying to elicit fares from newly arrived visitors! A journey in a taxi is not for the fainthearted in fact sometimes it can be terrifying, although I’ve yet to see an accident. Somehow all traffic seems to miss each other as they overtake and switch lanes with alarming regularity! If you are at all safety conscious then take the front seat. It’s the only place I’ve found a seat belt, despite the signs in the back urging me to belt up! Unlicensed Bike Taxi – use at your own risk! On most street corners you will find a collection of unauthorized electric bike taxis. 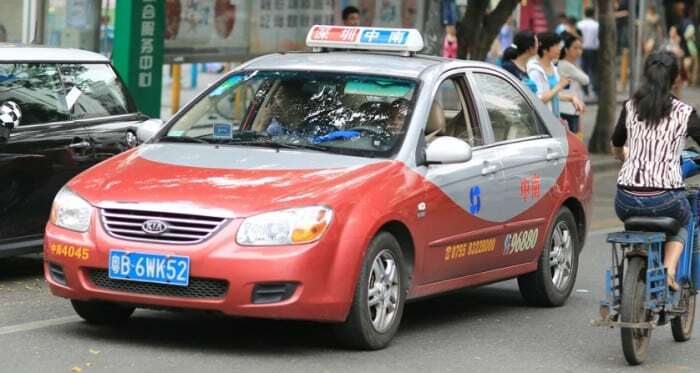 Although these have been banned in downtown Futian, they are still prevalent in the suburbs, and if you’re late for an appointment they provide a quick way to travel to your destination. Some riders will allow two passengers, although this does become a little more scary as the extra weight requires a serious balancing act as you weave through the traffic! The bikes sometimes use the “green way” cycle routes (although I’m not sure how legal this is) and frequently perform hair raising u-turns at heavily congested junctions. But if you hang on tight this is a great way to get about especially if like me you are often late for work! Always negotiate the price first, or you could find yourself paying more than a standard taxi. And like taxis, always have your destination written in Chinese, very few drivers know little more English than how to tell you the price! They will nod in agreement as you mention a shopping mall in English, only to deposit you somewhere totally unknown, whilst they insist (in Chinese) that this is where you really did want to be! 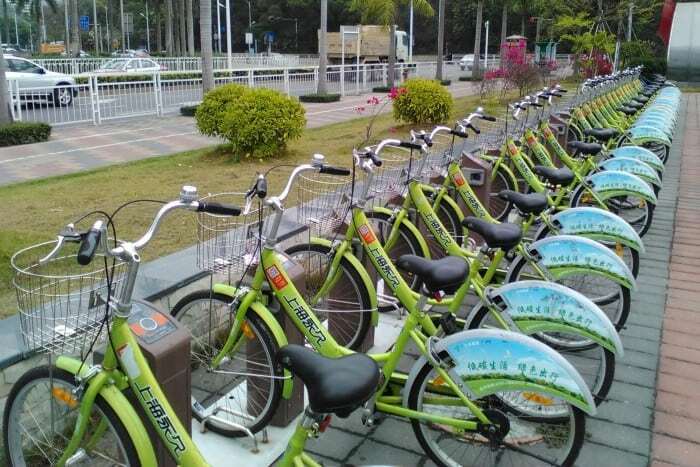 In an attempt to “go green”, Shenzhen now has over 10,000 bicycles available for hire. In fact, it seems like these brand spanking new green bicycles have been appearing just about everywhere during the last few months. The access stations are conveniently positioned by metro stations, shopping malls and city attractions. The plan is to encourage locals to use pedal power and help alleviate the congestion problems facing the city. But they also provide an extremely cheap way to get around and see some of the more interesting scenic spots. The system works in much the same way as any other city rental scheme around the world. You take a bike from one access point and discard it at another, within a designated time span. But the cost is astonishingly low at only 1 Yuan per hour or 25 Yuan per month! If only I could find out how to register! This is currently a work in progress. It seems that I must take my passport to a district office and purchase a rental card. I’m currently armed with all the information I need, and will shortly be embarking on what will no doubt be an interesting and time consuming trip to my local Nanshan district office. Watch out next month for the results of my expedition. I’ll also be giving you more information on how to make the most of the city green ways. In the meantime, if you speak, read or know someone that can understand Mandarin, here is the official Chinese website. So this probably isn’t an option yet for tourists, given the complexity of the system. But if you are living or working in Shenzhen then it could provide an eco-friendly transport option. Personally I’m looking forward to a leisurely cycle along the paved area of Shenzhen Bay. p.s. Click here to read my guide on how to cross the border between Hong Kong and Shenzhen! Vanessa Anderson is a global traveller living her life passionately by experiencing different cultures around the world. She currently lives in China working as an English teacher. You can follow her alternative lifestyle at www.DivergingRoads.com. I need to take a taxi from Shenzhen airport to a local hotel. Do taxis accept credit card? Really late, but in case anyone else has the same question. Cash or WeChat pay only in cabs! Great info! I’ve been to Shenzhen a few times and I finally had the courage to travel from Kowloon to Futian port by the Mtr. My next goal is to travel to my temporary office by train. Thanks for all the info.